One tightly held ASX minerals explorer, currently with an $18 million market cap, has just taken a position in one of the most significant mining districts in the world. This district is renowned for its poly-metallic deposits and is known as the “Land of the Giants” – not only due to the existence of nine giant (>100Mt) and three super giant (>200Mt) Volcanogenic Massive Sulfide (VMS) ore deposits ; but also because Rio Tinto, the second largest mining company in the world got its start here, and the $5BN capped Lundin Mining is mining for copper and zinc there right now. The area is the renowned Iberian Pyrite Belt – an approximate 250km-long belt that stretches East-West across the Iberian Peninsula, from Portugal to Spain. 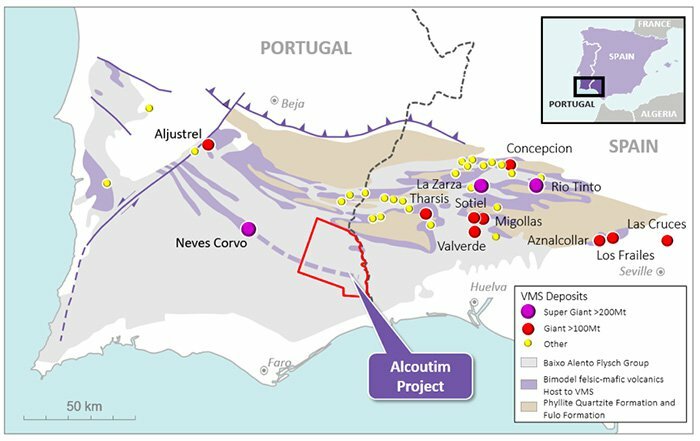 This cashed up ASX company has embarked on a process to spend ~AU$1.4 million to earn a 65% interest in the Alcoutim Project, a project immediately along strike and down plunge from Lundin Mining’s giant Neves Corvo deposit, located in Southern Portugal. and in the coming weeks this ASX stock is drilling along strike and down plunge from the deposit. The other two notable giant deposits are La Zarza (8 Mt contained Cu+Zn metal), and the original Rio Tinto mine (>3 Mt contained Cu+Zn metal). This earn in process will mean high priority geophysical targets are to be prodded with a drill bit in just 10 weeks’ time. Five holes will be targeted initially for 5,600 metres and the key to the company’s early success will be determined by its ability to hit sulphide mineralisation. By all accounts, and given the history of the area, this could happen sooner rather than later, so we’ll be keeping a keen eye on drilling results as they come through. However, this is an early stage play and investors should seek professional financial advice if considering this stock for their portfolio. With $8 million in cash and receivables to its name, and a tight share register, there are more than a few reasons to take a keen interest in this bold move by this up-and-coming minerals explorer. 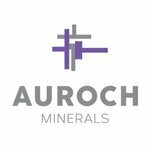 Auroch Minerals (ASX: AOU) is about to drill along strike from Lundin Mining’s massive Neves Corvo Copper & Zinc mine. This could be the defining moment for a company that is already exploring for lithium in Namibia. Adding zinc and copper could be the perfect way to round out a sustainable future-focused mining play. And it’s looking to add these metals in the world renowned Iberian Pyrite Belt (IPB). Some of the region’s 100 known deposits have been recognised since Ancient Roman times... one Iberian Pyrite Belt deposit in particular is what gave the world’s largest mining company – Rio Tinto – its name . The IPB contains 3 Super Giant deposits including the Neves Corvo deposit. 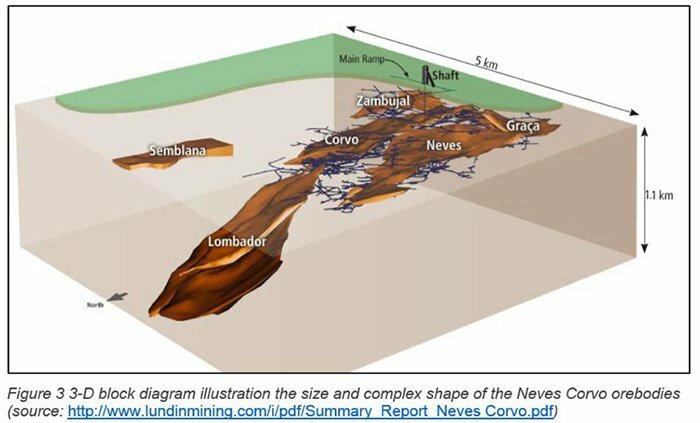 As stated above, AOU’s Alcoutim Project is in an area immediately along strike and down plunge from Lundin Mining’s giant Neves Corvo deposit. Discovered in 1977, this deposit was a turning point for the area as its true importance and potential to produce profitable minerals became fully recognised. The IPB is known to contain deposits rich in copper, zinc, lead, silver, tin and gold. 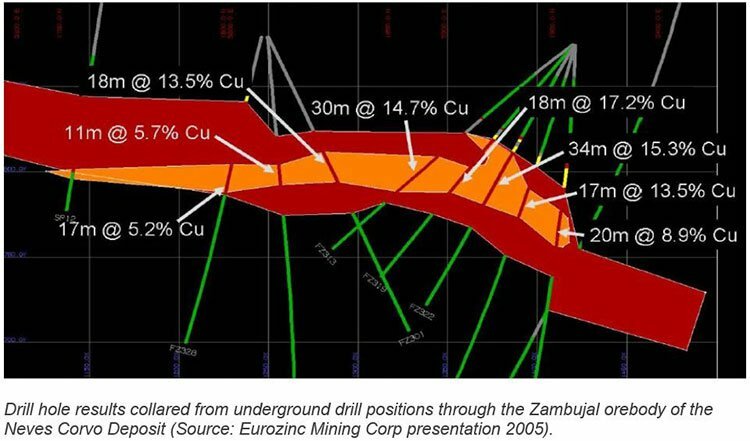 A review of publicly reported resources for the IPB’s major deposits indicates over 1,800 Mt of ore contained metal consisting of >15 Mt of Copper, >16 Mt of Zinc, >28 Mt of Lead, >26 M oz. of Gold and >1,300 M oz. of Silver. Which brings us to the importance of zinc and copper and why AOU believes it could be onto something big. You may have read a lot about zinc lately, as the best performing metal on the market. Zinc is a versatile metal and a sturdy choice for exploration, but let’s take a look at copper for a moment. It appears to have been somewhat forgotten in the rush into lithium and cobalt stocks – but copper too will play an essential role in the transformation of our vehicles. The average car on the road today uses a combustion engine, which requires around 25kg of copper. 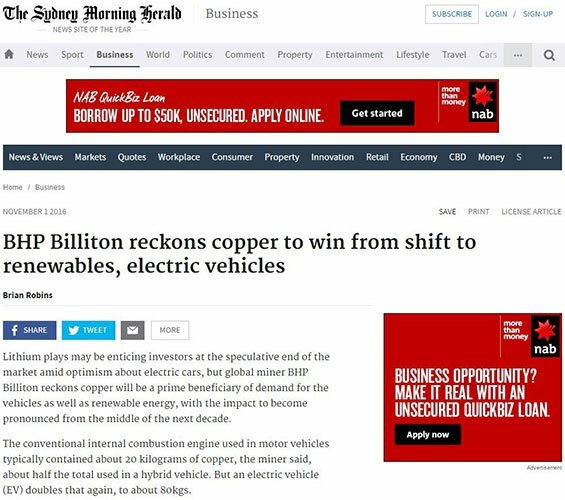 With the evolution to greener energy and greener cars, it seems highly unlikely that demand for copper will drop out. That’s not even including the global interest in wind turbines, which contain 3-4 tonnes of copper per megawatt. So with its latest JV, AOU is now in one of the most significant mining districts in the world, renowned for its Copper and Zinc dominant VMS deposits. Twenty-two geophysical targets comprising gravity, magnetic and EM anomalies have now been identified at the Alcoutim Project – and stage one of exploration will shortly begin, comprising five diamond drill holes at 5,600m. Considering both the multiple coincident magnetic-gravity-EM anomalies, and the fact the site is down plunge of the Super Giant Neves Corvo mine, it’s a very interesting time for the young company. And its shareholders. 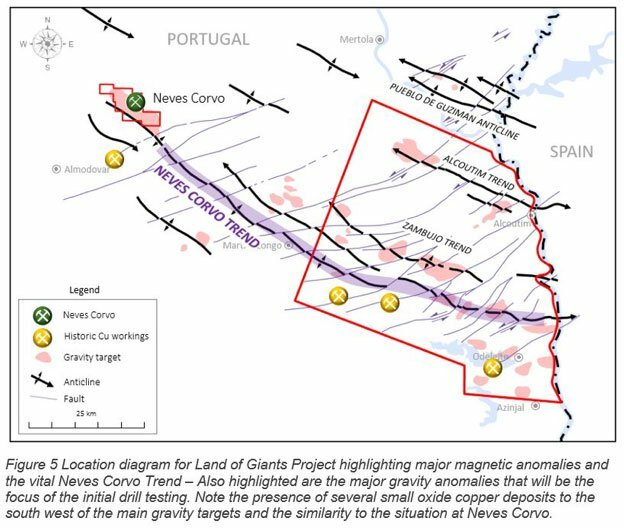 The Alcoutim Project covers 576 km 2 and lies immediately east and down plunge of the Super-Giant Neves Corvo deposit in Eastern Portugal. As you can see there is a continuation of the Neves Corvo Volcanics dashed line into the Alcoutim Licence covered by the younger rocks of the Baixo Alento Group. AOU’s license covers the interpreted down plunge extensions of the highly prospective Neves Corvo trend. Major gravity highs have been identified within the Alcoutim licence, with similarities to the anomalies found during the initial Neves Corvo exploration. AOU’s project has 22 defined geophysical targets that are ready to drill right now. It may not just be valuable minerals found in the old rock at the Alcoutim Project that could spell a valuation increase for AOU – there is evidence of remobilised copper deposits in the south of the license area. It’s possible that these smaller deposits represent remobilised copper from deeper mineralisation – which could also provide an explanation for the anomalies that have shown up at the site. The anomalies could well be hinting at a bigger Resource deeper down. Importantly all the deposits occur in a stratigraphic interval that is characterised by bi-modal felsic and mafic volcanic rocks... what this means, effectively, is that the formations act as a ‘control’ which focuses exploration onto these horizons. Why spend time telling you in words what can easily be described through a visual aid? You can see that the IPB holds a vast amount of contained metal – far greater than other big name mining regions of the world. 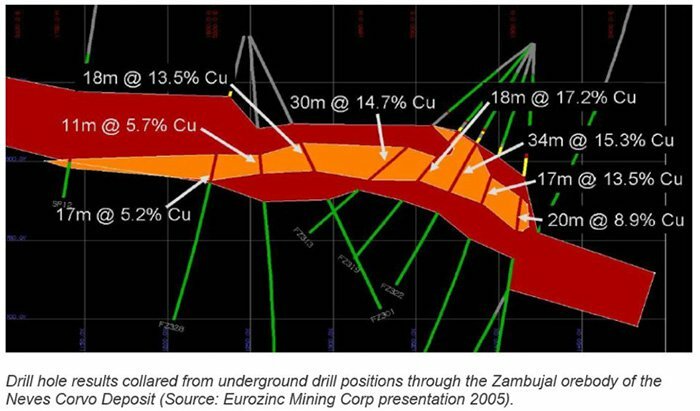 And we think it’s well worth a knowledgeable company getting the license to explore for zinc and copper there – definitely worth the A$1.4 million that AOU spent to get its piece of the pie. Of course any success AOU may experience is speculative at this stage, so investors should take a cautious approach to any investment decision they make with regard to this stock. Drilling will commence very soon, only a matter of weeks away. Phase One will comprise five diamond holes at 5 of the 10 highest priority magnetic, gravity and EM targets. After each borehole is done, a series of down-hole geophysical surveys will be conducted which should dramatically increase the effective search area outside the immediate drill hole. A budget of ~A$1.4 million (€1.1M) has been agreed for the first Phase of the drilling program, after which Auroch will hold 65% of the Alcoutim Project. To begin with, Phase one will target the source of the EM anomalies (likely sulphide rich volcanic or sedimentary rocks); the nature of the massive magnetic anomalies (likely mafic magmatic rocks which could have triggered VMS mineralisation); gravity anomalies which are not directly associated with peak magnetic anomalies; and alteration haloes that surround VMS. In this initial stage, success would be the holes intersecting sulphide mineralisation. When it comes to VMS, this can be a stockwork of sulphide veins, as discovered by Rio Tinto; disseminated sulphides in black shales; or the ultimate ‘Eureka’ moment... a massive sulphide mineralisation such as Zambujal at Neves Corvo. The green light has already been given for drill pads, water abstraction and the work itself – so things are moving very quickly. AOU has entered into a binding agreement with the owners of the Alcoutim Project to acquire up to a 75% interest in the Project by farming into the incorporated joint venture. The project itself is wholly owned by a JV company (Bolt Resources) through which AOU and the other joint venture participants will hold their interest. Assuming all relevant draw down conditions are met, AOU will loan €1,100,000 to Bolt to fund operations that will include an exploration drilling programme (initially for ~3,000m of drilling and up to 5,600m). What comes of this remains to be seen, so investors should seek professional financial advice if considering this stock for their portfolio. If Bolt’s prospecting licence is not successfully renewed by 31 December 2017, AOU have a get out of jail free card – the agreement stipulates the company’s right to terminate the agreement in this case and the loan will be repayable within 7 days. The license itself covers 576 km 2 and encompasses the right to explore for mineral deposits of gold, silver, copper, zinc, lead, tin, tungsten, antimony and associated metals. It is valid for three years with a maximum of two one-year extensions. As you’re no doubt aware, Portugal is a modern European country and a popular tourist destination. As a choice for minerals exploration, it could be considered first class in terms of infrastructure, security and transparency of mining laws. In fact the government in Portugal sees mining as a significant part of its forward-looking economic prosperity and is welcoming of mining investment. Which shows in the numbers... several international companies – Lundin Mining, Almonty Industries, Medgold Resources, Dakota Minerals, Colt Resources & Avrupa Minerals – are conducting exploration on base and precious metals, in recent times with a focus on lithium. There are still large expanses of prospective land that are still largely underexplored – despite the early mining done by the Phoenicians and Ancient Rome. Portugal has modern roads, efficient power and communication networks and easily accessible ports and airports and is ranked 26th out of 160 countries by the World Bank in their 2014 Logistics Performance Index. As an added advantage, there are significant European Union and Portuguese government financial incentive programs which can come in handy towards the business end of things. Copper is the highest rated thermal and electrical conductor among engineering metals, and all power systems utilize copper to generate and transmit energy with maximum efficiency and minimum environmental impact. Because of these excellent physical properties, industry experts are predicting a significant upswing in the use of copper for electrical infrastructure beyond electric cars and batteries. We can’t know for sure the exact speed at which electric vehicles will be adopted by various countries around the world... in fact, demand could rise even faster than what’s estimated. The question is, whether demand rises quickly or slowly, who will manufacturers look to as their preferred source of the precious metal? A company with a good game plan who is in it for the long-term; perhaps a company with excellent foresight, which gained interest in a highly prospective holding for a competitive price... and which identified an opportunity to piggyback off the research and process refinement of some major players operating in the same area. Perhaps a company like AOU who are making serious moves and wasting no time about it. Right now, it may seem like a David among surrounding Goliaths, but it’s possible for a quick and nimble David to do very well in ‘The Land of the Giants’. At any rate, once the drill-bits start spinning in a few weeks’ time, we’ll be on our way to finding out. But keep in mind, by the time we know with greater certainty, AOU’s shares may not at their current low levels.